In the fall of 2017, crew on the new M/V Ocean Warrior patrol vessel (awarded to Sea Shepherd by the Dutch Postcode Lottery) began working in partnership with the East Timor National Police (PNTL - Policia Nacionale Timor-Leste) to stop a fleet of 15 industrial fishing ships suspected of targeting sharks in East Timor and possibly the neighboring waters of Indonesia and Australia. Operation Apex Harmony - Timor Leste is one of Sea Shepherd's many campaigns to put an end to illegal, unreported and unregulated (IUU) fishing. A joint operation conducted at dawn on September 9th with Sea Shepherd's M/V Ocean Warrior and the East Timor National Police (PNTL - Policia Nacionale Timor-Leste) results in the capture of the Hong Long Fisheries / Pingtan Marine Enterprises fleet at anchor off the coast of Com, East Timor. 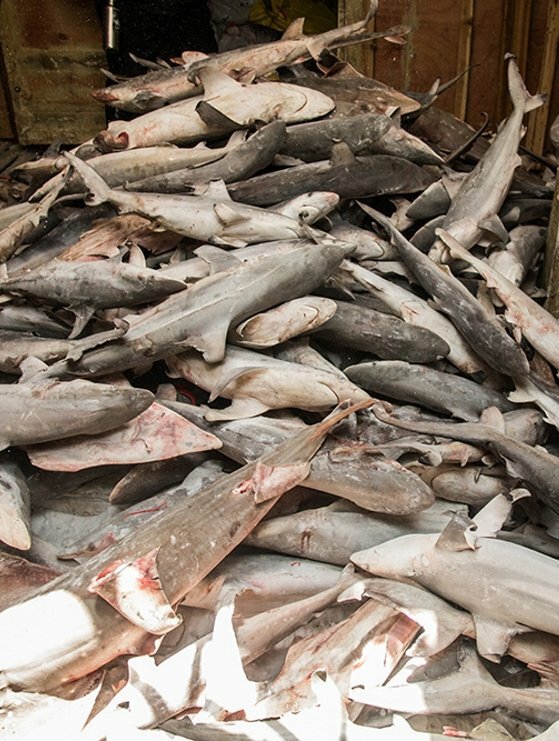 As suspected, the cargo holds were filled with illegally slaughtered sharks. The crew of Sea Shepherd's M/V Ocean Warrior patrolling the waters of East Timor. Photo Gary Stokes / Sea Shepherd. The Ocean Warrior watches over the Hong Long Fisheries / Pingtan Marine Enterprises fishing fleet in East Timor. Photo Gary Stokes / Sea Shepherd. Policia Nacionale Timor Leste , Maritime Command, and Sea Shepherd crew. Photo Jake Parker / Sea Shepherd. Dead sharks fill the holds of the Hong Long Fisheries / Pingtan Marine Enterprises fishing fleet. Photo Jake Parker / Sea Shepherd.